The mother of the groom should put together a guest list from the groom’s family and close family friends. She can indicate those that should ideally be invited to the whole event and those that might get an invite just to the evening reception. She should avoid complaining if she is permitted fewer guests than she had planned; the size of their guest list may depend on their financial contribution to the big day. As soon as it is convenient after you announce your engagement your fiancé’s mother should send a message to your parents, or give them a call to invite them over for dinner or drinks and let them know how happy she is at the news. There may well be some preliminary discussions at this gathering about who will be paying for what so parents should be ready to start this conversation. 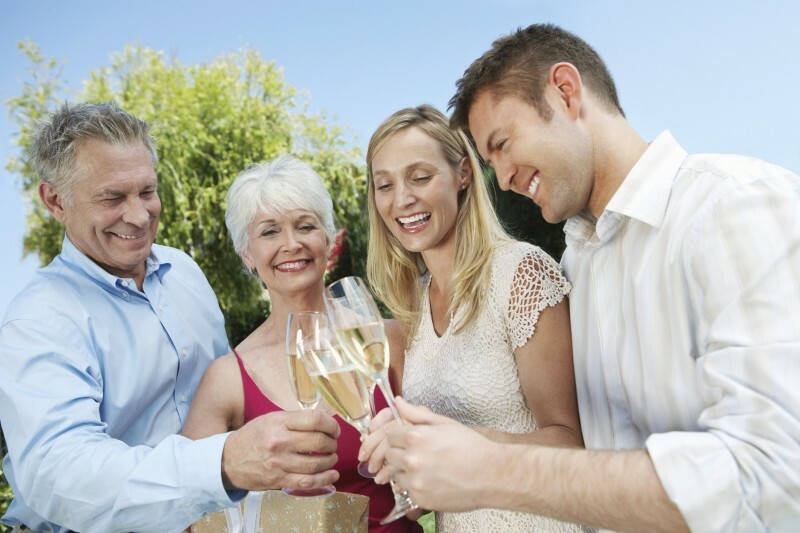 Conventionally the bride’s family will hold an engagement party and bridal shower, but if the groom’s parents live too far from them it may be more convenient for the mother of the groom to arrange a separate party rather than ask everyone to travel for miles. The mother of the groom’s party should be held after the mother of the bride’s and she should discuss this with the mother of the bride and explain the distance issue so as not to be seen as being rude. The groom’s mother should plan and host the rehearsal dinner if you are considering having one. You should provide her with a guest list and feel free to give her any pointers concerning the style and formality of the event. If you’d rather have a casual barbeque than a traditional dinner party make sure the mother of the groom is informed of that. Whether it’s finding an appropriate caterer, checking out venues, getting quotes from florists, or organising the wedding cake, the grooms mum will enjoy being involved in your wedding preparations and it can relieve some of the burden on you. There are plenty of things to do in the count down to the wedding so your future mother-in-law will probably be happy if you delegate some of the tasks to her. On the day of the wedding you could put her in charge of one task, such as making sure the flower arrangements are transported from the ceremony to the reception, but she will spend most of her time smiling, mingling with the guests, and being complimented on her son’s choice of wife. Her last duty of the day will be to dance with her son, a task that she shouldn’t find hard at all, but before that, if you have organised a receiving line, she will be part of that. Alternatively you may decide to have both sets of parents announced as they arrive at the reception. There are some elements of the wedding that the groom is traditionally responsible for such as the honeymoon, wedding night accommodation, and the wedding car. As the bride you shouldn’t really question him about these arrangements as you can be accused of meddling, however his mother could attempt to have a quiet word.